Try to be the only one that can use the Dogma when you activate it. Try to use dogmas that allow you to do multiple actions at once, like draw and meld. This saves you actions. Keep you piles as current as possible with the new technology. The game moves fast and even if you found a “point maker machine”, you need to abandon it as it starts to get out dated. Fortresses are strong early but become obsolete very quickly. Industry is a good investment later in the game. Light bulbs can help but seems to be a victim of randomness. There are many ways to win this game, so read the cards and keep your mind open. The good news about this game is that anyone that hasn’t scored any achievements late in the game can still come from behind and win (I have seen it happen on my first game). 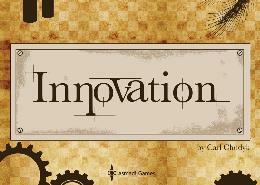 For your first time, sit back and enjoy the random waves that make up the fun of Innovation!